Planting blueberries requires special care and attention to the soil pH. Blueberry bushes are one of the best choices for the home garden because they take up little space. After the first few years, you'll be surprised at the volume of blueberries one little bush can produce! Success with blueberry bushes starts with the right kind of soil. Many would-be blueberry growers fail because they never tested and amended their soil. Blueberries also have special light and climate requirements. The best time for planting blueberries is the spring. Planting blueberries in the spring gives them the spring, summer and fall to establish a strong root system. Blueberries produce few fruits for the first three years, although by year three you should see some berries. Instead, they put their energy into developing a robust root, branch and leaf system. After the third year, you should see a good crop of sweet, juicy blueberries. You may even need to use bird netting or fencing of some sort to keep critters and birds from eating your berry harvest. Blueberry bushes need full sun. Full sun is defined as six or more hours of direct sunlight every day. If you're not sure if you have full sun or not, think about the amount of light an area in the garden receives in the summertime. A spot may get full sun in the winter when the tree branches are bare, but when your trees leaf out in spring, if they shade the garden area there won't be enough light to let your blueberry bushes thrive. Planting blueberries in shady areas is a mistake many gardeners make. If you don't have good light in the garden, you can grow some varieties of blueberries in containers or pots. If your deck or patio is in full sun all summer long or you live in an apartment, container-grown blueberries are a great option. Just make sure the container is large enough for the mature plant. By far the most important consideration when planting blueberries is the soil pH. The pH scale in chemistry measures how acidic, neutral or alkaline a substance is. The scale goes from 0 (pure acid) to 14 (pure alkaline) with 7 at the neutral point. Soil pH varies from one location to another; it can even vary from place to place in your backyard, depending on what was grown there before. Blueberry bushes require acid soil with a pH of 4.0 to 4.5.To determine the pH of your soil, you can either purchase a home pH test kit at the garden center or bring a soil sample in to the garden center or the local county Cooperative Extension office. There may be a small fee to test your soil professionally, but the person conducting the test can offer ways to adjust the soil pH to the range you need to grow blueberries successfully. Another reason why blueberry bushes are so popular in the home garden is their high tolerance for poor soils. In the wild, they grow in rocky places and poor soil, and this adaptability makes them very forgiving in the garden. They can be grown in rocky or clay soils without a problem as long as they get full sun and the pH is within their preferred range. Blueberry bushes are commonly sold in two different packages. 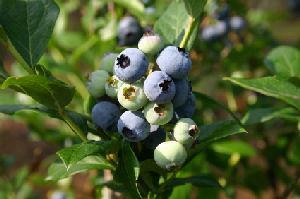 A boxed blueberry bush consists of a dormant stem and minimal roots packaged in peat moss or some other medium. Blueberry bushes are also sold in containers or pots like any other shrub. It's safe to plant blueberry bushes after all danger of frost is past. To plant container grown blueberry bushes, dig a hole twice as wide and deep as the pot. Add amendments such as compost and peat moss to the soil. Place the root ball of the blueberry into the hole and fill around it with soil, pressing down slightly with your foot or your hands. Water well. For blueberry bushes purchased in a box, follow the directions. Typically, the hole is smaller. Some directions may ask you to soak the root for an hour or two before planting to break the dormancy period in which such plants are shipped. If you're planting more than one blueberry bush, leave several feet between the plants. Blueberries are self-pollinating so you only need one plant to get a crop of berries. However, if you plant more than one variety, gardeners swear the fruits are bigger, sweeter and juicer than if you have only one bush. By following these directions for planting blueberries, you should have a good crop in a few years. Test your soil, amend it, and plant blueberries. You'll enjoy these super fruits for years to come!